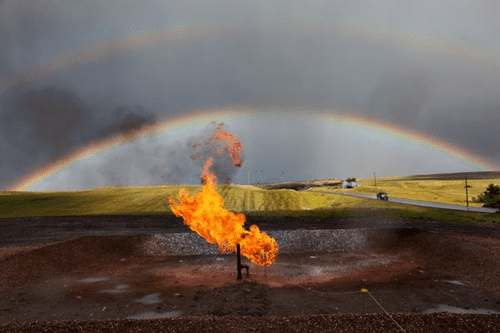 A trio of newly published studies showed once again that natural gas is not a clean energy bridge – the studies highlighting the various problems associated with natural gas. Natural gas will not dawn a cleaner day in terms of energy. Image via Ohio Citizen. Firstly, it was shown that emissions databases underestimate the methane released from fossil-fuel extraction in the U.S. Southwest. “A global gas boom is not a replacement for energy and climate policies,” write Steven J. Davis and Christine Shearer of the University of California, Irvine, in commentary accompanying one paper. The team, which was lead by Eric A. Kort of the University of Michigan, Ann Arbor used satellite observations to map how that actual methane emissions in that region are about 2 to 3.5 times more than estimated. The results show that we need to reconsider natural gas as a clean substitute for coal and as a bridge towards sustainable development. In a separate study, researchers led by Haewon C. McJeon of Pacific Northwest National Laboratory looked at the effects of low-cost, abundant natural gas in an integrated global energy. In other words, he analyzed what would happen to the global energy market if abundant and cheap gas would be available – something which is quite possible in the near future. What he found is that as natural gas becomes cheaper it will replace coal and fuel less emissions, but it might also stunt emerging renewable energy sources, such as wind and solar. In the third study, a team led by Thomas Gibon and Edgar G. Hertwich at the Norwegian University of Science & Technology conducted global, long-term life-cycle assessments of low-carbon systems (photovoltaic and solar thermal, wind, and hydropower for instance) and showed that implementing such systems at a large scale would not only double the double the world’s electricity supply by 2050, but it will also stabilize or even decrease greenhouse gas emissions. They showed that unlike natural gas, renewable energy can lead to a sustainable future. To sum it up, the scientific evidence is starting to add up and show that natural gas, while cleaner than coal, is not a solution. It may act like a temporary buffer, like a band-aid you put to stop the bleeding, but it won’t cure the injury. We need to find other, better ways of providing energy for the growing population.